A deck is a permanent covering over a compartment or a hull of a ship. On a boat or ship, the primary or upper deck is the horizontal structure that forms the "roof" of the hull, strengthening it and serving as the primary working surface. Vessels often have more than one level both within the hull and in the superstructure above the primary deck, similar to the floors of a multi-storey building, that are also referred to as decks, as are certain compartments and decks built over specific areas of the superstructure. Decks for some purposes have specific names. The main purpose of the upper or primary deck is structural, and only secondarily to provide weather-tightness and support people and equipment. The deck serves as the lid to the complex box girder which can be identified as the hull. It resists tension, compression, and racking forces. The deck's scantling is usually the same as the topsides, or might be heavier if the deck is expected to carry heavier loads (for example a container ship). The deck will be reinforced around deck fittings such as the capstan, cleats, or bollards. On ships with more than one level, deck refers to the level itself. The actual floor surface is called the sole, the term deck refers to a structural member tying the ships frames or ribs together over the keel. 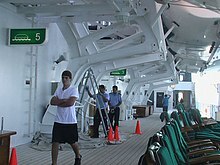 In modern ships, the interior decks are usually numbered from the primary deck, which is #1, downward and upward. So the first deck below the primary deck will be #2, and the first above the primary deck will be #A2 or #S2 (for "Above" or "Superstructure"). Some merchant ships may alternatively designate decks below the primary deck, usually machinery spaces, by numbers, and those above it, in the accommodation block, by letters. Ships may also call decks by common names, or (especially on cruise ships) may invent fanciful and romantic names for a specific deck or area of that specific ship, such as the Lido deck of the Princess Cruises' Love Boat. Equipment mounted on deck, such as the ship's wheel, binnacle, fife rails, and so forth, may be collectively referred to as deck furniture. Weather decks in western designs evolved from having structures fore (forward or front) and aft (rear) of the ship mostly clear; in the 19th century, pilothouses/wheelhouses and deckhouses began to appear, eventually developing into the superstructure of modern ships. Eastern designs developed earlier, with efficient middle decks and minimalist fore and aft cabin structures across a range of designs. 01 level is the term used in naval services to refer to the deck above the main deck. The next higher decks are referred to as the 02 level, the 03 level, and so on. Although these are formally called decks, they are usually referred to as levels, because they are usually incomplete decks that do not extend all the way from the stem to the stern or across the ship. Afterdeck an open deck area toward the stern-aft. Berth deck: (Naval) A deck next below the gun deck, where the hammocks of the crew are slung. Bridge deck: (a) The deck area including the helm and navigation station, and where the Officer of the Deck/Watch will be found, also known as the conn (b) An athwartships structure at the forward end of the cockpit with a deck, often somewhat lower than the primary deck, to prevent a pooping wave from entering through the companionway. May also refer to the deck of a bridge. Flush deck: Any continuous unbroken deck from stem to stern. Forecastle deck: A partial deck above the main deck under which the sailors have their berths, extending from the foremast to the bow. Gun deck: (Naval) on a multi-decked vessel, a deck below the upper deck where the ships' cannon were carried. The term originally referred to deck for which the primary function was the mounting of cannon to be fired in broadsides. However, on many smaller and unrated vessels the upper deck, forecastle and quarterdeck bore all of the cannons but were not referred to as the gun deck. Half-deck: That portion of the deck next below the forecastle or quarterdeck which is between the mainmast and the cabin. Lido deck: Open area, typically at or near the stern of a passenger ship, housing the main outdoor swimming pool and sunbathing area. Quarterdeck: (a) The part of the upper deck abaft the mainmast, including the poop deck when there is one. Usually reserved for ship's officers, guests, and passengers. (b) (Naval) The shipboard area, connected by a gangplank to a dock or another ship, where personnel arrive and depart a naval vessel in port. It is where the Officer of the Deck and his assistants are stationed, official visitors received, and personnel arrival/departure ceremonies conducted. In the event of multiple gangplanks, only one will lead to the official Quarterdeck; the others will be manned by Junior OODs or a Petty Officer of the Watch. The Quarterdeck also functions as an administrative point in port, where the ship's log is maintained, announcements are made via the 1MC (public address system; "Tannoy" in some navies), the ship's bell rung, etc. (c) (Naval) Some ships have a space named "Quarterdeck", usually amidships, that normally, but situationally may not, be used for that purpose. Spar deck: In larger vessels during the age of sail, spare spars could be roped together to provide a temporary surface known as a "spar deck." These served as jury-rigged repairs for permanent decks, or as an additional platform under which to shelter goods or crew. The term was also informally applied to areas of the forecastle or quarterdeck where spare spars were stored by laying them flat against the existing decking. In the modern era the term has been used to describe the uppermost deck on flush decked vessels. On Great Lakes bulk freighters this is the term used for the deck over the cargo holds. 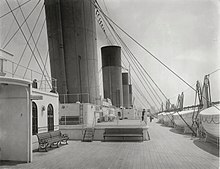 Steerage: The lower deck of a ship, where the cargo is stored above the closed hold. In the late 19th and early 20th century, steamship steerage decks were used to provide the lowest cost and lowest class of travel. Well deck: (a) An exposed deck (weather deck) lower than decks fore and aft. In particular it is one enclosed by bulwarks limiting flow of water and thus drainage. (b) (Modern naval) A hangar-like deck located at the waterline in the stern of some amphibious assault ships, also known as a well dock. By taking on water the ship can lower the stern flooding the well deck and allowing boats and landing craft to dock within the ship. 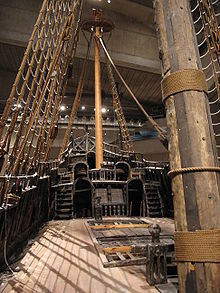 A traditional wood deck would consist of planks laid fore and aft over beams and along carlins, the seams of which are caulked and paid with tar. A yacht or other fancy boat might then have the deck canvased, with the fabric laid down in a thick layer of paint or sealant, and additional coats painted over. The wash or apron boards form the joint between the deck planking and that of the topsides, and are caulked similarly. Modern "constructed decks" are used primarily on fiberglass, composite, and cold-molded hulls. The under structure of beams and carlins is the same as above. The decking itself is usually multiple layers of marine-grade plywood, covered over with layers of fibreglass in a plastic resin such as epoxy or polyester overlapped onto the topsides of the hull. Generally speaking, the method outlined for "constructed decks" is most similar to metal decks. The deck plating is laid over metal beams and carlins and tacked temporarily in place. The difficulty in metal construction is avoiding distortion of the plate while welding due to the high heat involved in the process. Welds are usually double pass, meaning each seam is welded twice, a time consuming process which may take longer than building the wood deck. However, welds result in a waterproof deck which is strong and easily repairable. The deck structure is welded to the hull, making it structurally a single unit. Because a metal deck, painted to reduce corrosion, can pick up heat from the sun, and be quite slippery and noisy to work on, a layer of wood decking or thick non-skid paint is often applied to its surface. The process for building a deck in fiberglass is the same as for building a hull: a female mould is built, a layer of gel coat is sprayed in, then layers of fiberglass in resin are built up to the required deck thickness (if the deck has a core, the outer skin layers of fiberglass and resin are laid, then the core material, and finally the inner skin layers.) The deck is removed from the mould and usually mechanically fastened to the hull. Fiberglass decks are quite slick with their mirror-smooth surfaces, so a non-skid texture is often moulded into their surface, or non-skid pads glued down in working areas. The thickness of the decking affects how strong the hull is, and is directly related to how thick the skin of the hull itself is, which is of course related to how large the vessel is, the kind of work it is expected to do, and the kind of weather it may reasonably be expected to endure. While a naval engineer or architect may have precise methods of determining what the scantlings should be, traditional builders used previous experiences and simpler rules-of-thumb to determine how thick the deck should be built. The numbers derived by these formulae gives a rough number for determining the average thickness of materials based on some crude hull measurements. Below the waterline the thickness should be approximately 115% of the result, while upper topsides and decks might be reduced to 85% of the result. In wood – For plank thickness in inches, LOA (Length OverAll) and Beam are measured in feet. For plank thickness in mm, LOA and Beam are measured in meters. In fiberglass – For skin thickness in inches, LWL (Length WaterLine) is in feet. For skin thickness in mm, LWL is in meters. In fiberglass sandwich – First determine the skin thickness as single skin, then multiply by modifiers for inner skin, outer skin, and core thicknesses. Cored decks might be modified even thicker, 2.6–2.7, to increase stiffness. ^ "PROFILES AND WEATHER DECK PRESENTATIONS". Federation of American Scientists. Retrieved 2016-07-18. ^ a b c d e "NEW TERMS FOR STEEL NAVAL VESSELS; Secretary Herbert Invents a New Nomenclature for These Ships" (PDF). The New York Times. June 11, 1895. Retrieved July 18, 2016. ^ Oxford English Dictionary. "Lower n.4". Mar. 2009 Online edition. Retrieved 2009-04-06. ^ Oxford English Dictionary. "Orlop n.". Mar. 2009 Online edition. Retrieved 2009-04-06. ^ Kemp, Peter, ed. (1993). The Oxford Companion to Ships and the Sea. Oxford, United Kingdom: Oxford University Press. p. 820. ISBN 0192820842. ^ United States Coast Guard. "United States Coast Guard, Sector Upper Mississippi River, Small Passenger Vessel Information Package" (PDF). NARCIKI - Naval Architecture Wiki Project. Retrieved 4 March 2012. ^ "Well Deck (definition)". NARCIKI - Naval Architecture Wiki Project. Retrieved 4 March 2012. Equipment on forecastle deck of ship.